I finally finished these Scrabble coasters I’ve been working on forever. There were so many issues with this project, I’m calling these beta and plan to completely redo them. This is all fine though, as I spent some time this weekend explaining to the kids that screwing up and doing things wrong is all part of learning. Fail faster and all that. 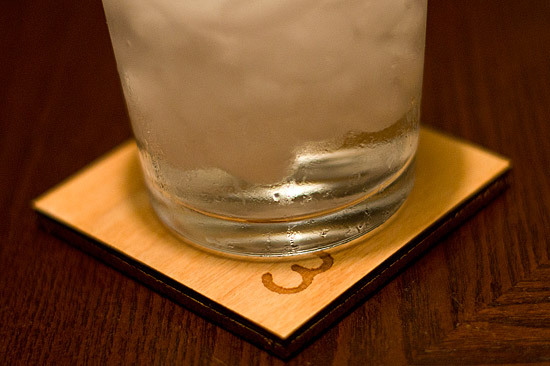 I’m pretty sure that the next version of these coasters will not have all the problems that this version had. So what were the problems? Well, for one thing, I’ve really got to remember to sand the wood first! Yeah, like, before I etch it. Not a huge deal, but I think they’d look better if I had sanded first. As for the backing, I first thought about using cork, but decided against it but then I had to use cork to cover up the mistake on the back of using the wrong wood stain. The cork was not easy to cut, and there are some rough edges. I used a lot of X-ACTO blades in the process, but I think this cork may have been aged a bit too long. As for the wood stain, the wrong stain nearly torpedoed this project. Lesson learned? Test the stain on scrap wood. Besides all that, I think they turned out pretty good. Oh, while I was using the laser cutter at Milwaukee Makerspace Shane commented that the letters looked a little rough. I had to explain that I didn’t just type up the letters in CorelDraw, I actually scanned real Scrabble tiles, as I wanted these to be authentic replicas, only much larger. I probably didn’t get the color quite right, but again, I’d like to redo the whole project. A deeper/darker etch may be in order next time, and I’ve got another idea for the backing/feet. Posted on Monday, June 25th, 2012 at 8:45 am. Subscribe to the comments feed. Both comments and pings are currently closed. Post on your own blog. 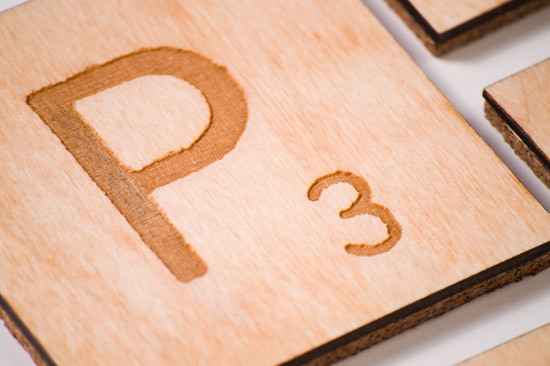 Next up, complete periodic table of coasters? That’s a good idea! 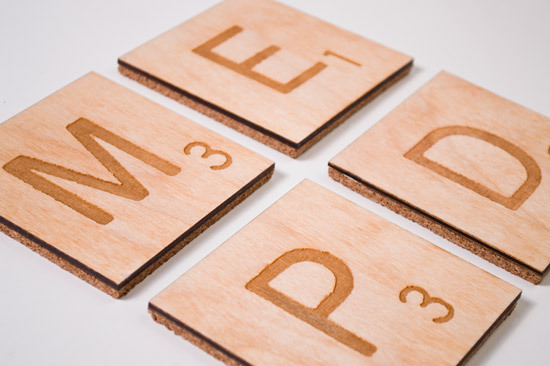 I’ll have to try doing that with my CNC router! A trick I was taught when trying to cut fine lines for woodblock was to use a spit coat of shellac before cutting. You got a sharper edge. It can be removed with alcohol later if need or for this app just left on and stained and finished over. For cutting cork the cork likes to be compressed at the cut line while you cut. caohaoim, ah, thanks for the tip on compressing the cork. That may save on the number of blades I use if I do it that way next time.